Josh Kopelman over at the Redeye VC blog has a great post (see image from post– click for larger image in original post) on the importance of the part of the demand curve when the price moves from “free” to “not-free.” As a venture capitalist, Josh focuses on the need to understand how hard it is to move people along this part of the curve, and the need to consider alternative revenue sources, such as advertising, to monetize free services. As pricing people, we may fall into the same trap as entrepreneurs, saying things like “it’s only a $5 a month, we’ll get 10% of the market.” $5 per month is infinitely more expensive than free, however. So people only sign up to “premium plans” if there is clear value. 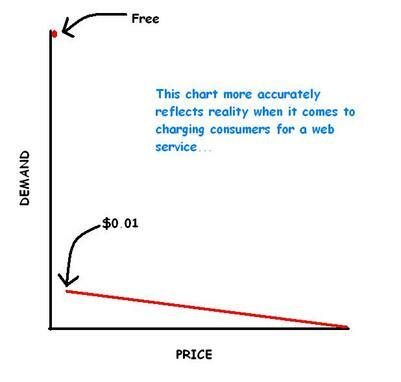 This is especially acute for companies that offer free and premium editions of the same product or service. How many home computer users upgrade to ZoneAlarm Pro? Or QuickTime Pro? The focus for these types of products must be entirely on business purchasers. You can certainly build a good around it, but don’t assume that you can get X% of your “free” market to start paying you.